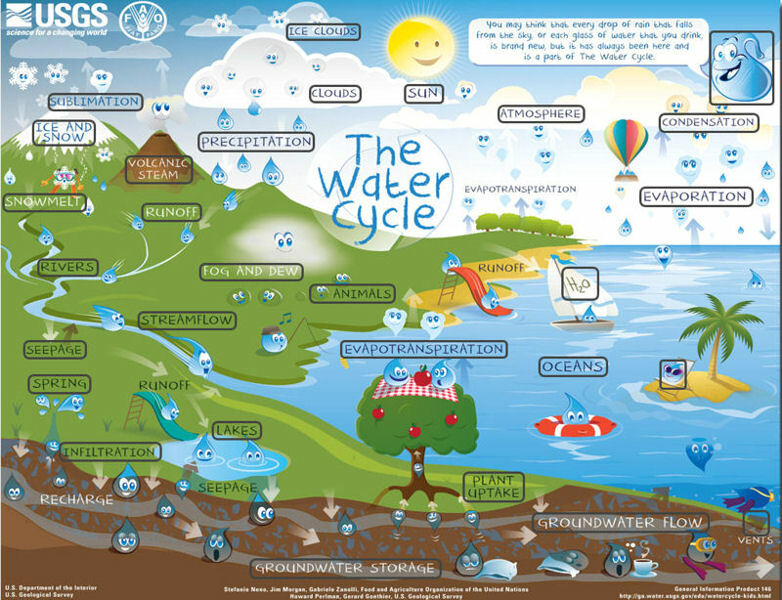 The Water Cycle for Kids diagram educates about all portions of the water cycle. Photo courtesy of the U.S. Geological Survey (USGS). Click to see the interactive USGS diagram. Take learning about water to the Web through the U.S. Geological Survey (USGS) Water Science School. The website, launched in 1997, helps anyone age 6 or older become a water student. The Water Cycle section offers a comprehensive discussion about all aspects of the water cycle, said Howard Perlman, USGS hydrologist. This section is available in more than 60 languages. Recently, USGS added The Water Cycle for Kids to this section. The newest addition includes a diagram developed by USGS and the United Nations. The interactive diagram has pop-up explanations of the stages of the water cycle, associated photos and graphics, and links to more information. Users can print the diagram in regular- or poster-size or see an interactive version offered for three different levels: beginner, intermediate, or advanced. Other Water Science School sections include Water Basics, Water Properties and Measurements, Surface Water, Groundwater, Water Quality, Activity Center, Water Science Photo Gallery, Water Questions and Answers, Water Use in the United States, Teacher Resources for Water Science, and Water Science Glossary. Through these portals, anyone who wants to learn more can access information on topics such as forms of water, location and quantity of water on Earth, physical and chemical properties of water, pollution, and water use. Information is incorporated into all aspects of the site, from photo captions to diagrams. The website includes a number of interactive opportunities including surveys, quizzes, and questionnaires. For many of the activities, responses are tabulated and displayed in tables that organize respondents by location, Perlman said. “This offers the teacher the opportunity to discuss why people in one area may think differently than people in another area,” he said. “The website has been growing in both size and popularity,” Perlman said. Currently it draws about 40,000 views a day from users in more than 100 countries.